Product code: ES6467 Categories: Sold Items, Sold Jewellery. There is nothing like an elegant pair of earrings to complete an outfit, and here are a spectacular pair of Art Deco ruby and diamond earrings that are just divine to wear. Guaranteed to always be admired, these Art Deco earrings date from the 1930’s and were beautifully hand made in 18ct yellow gold. Set with a central diamond surrounded by fifteen natural rubies, day or night they will always get the attention and admiration they rightly deserve. In the centre is the diamond that sparkles wonderfully and is surrounded by fifteen square cut rubies. The diamonds total 1.20 carats and the rubies 0.75 carats making them sure to be admired every single time that they are worn. Measuring 11mm in diameter makes them really stand out so well and they are so comfortable to wear all the time day or night and are fitted on post and butterfly fittings with a screw thread for added security. 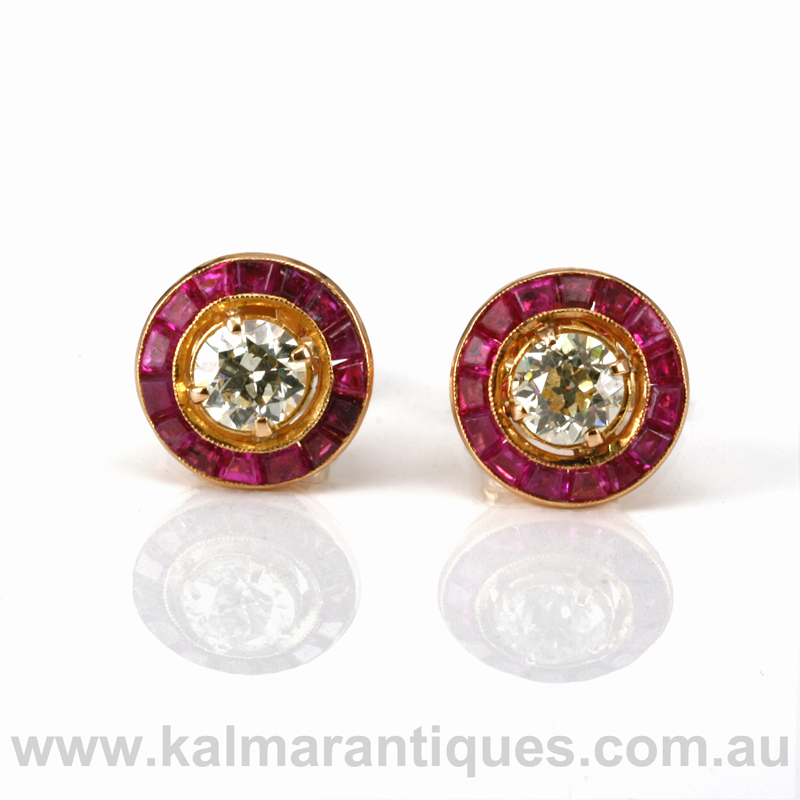 Art Deco earrings are just so lovely to wear and these ruby and diamond earrings are just perfect.